Annibale Carracci "Sonatore in Piazza"
The original to this copper engraving with the title 'Sonatore in Piazza' in my collection was made by the Italian painter Annibale Carracci (1560-1609) and it shows a young man or a boy, obviously left-handed, playing a lute. The engraving dates from the early part of the 17th century and it is signed "A.C." on the plate. The engraving was reproduced in 'Diverse figure al numero di ottanta, disegnate di panna, nell' hore di ricreatione, da Annibale Carracci, ... e cavate dagli originali, da Simone Guilino ... Roma : Nella Stamperia di Lodovico Grigniani', , as plate 36. There is a copy of this book in the Library of Congress, Washington, USA, which contain this particular engraving (call number NC1155.C3 and reproduction number LC-USZ62-99167 DLC). The plate in my collection does not have the initials of the engraver, " S.G.", but only that of the artist "A.C.", but seems otherwise to be identical with the one in the Library of Congress. 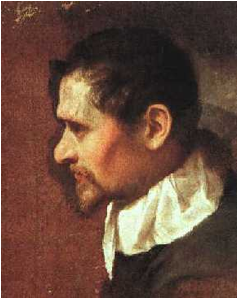 Annibale Carracci belonged to a family of Bolognese painters, the brothers Agostino (1557-1602) and Annibale and their cousin Ludovico (1555-1619). They worked together early in their careers. In the 1580s they opened a private teaching academy, which originally was called the Accademia dei Desiderosi, but later changed its name to Academia degli Incamminati. In their teaching they laid special emphasis on drawing from the life and all three were outstanding graphic artists. Annibale is considered to be the greatest artist of the family. He was careful to portray realism in his works, and he painted both religious and mythological themes, as well as scenes from everyday life. The 'Sonatore in Piazza' is a good example of the latter. Cardinal Odoardo Farnese called Annibale to Rome and there he carried out his masterpiece, the decoration of the Farnese Gallery in the cardinal's family palace. In his last years Annibale was overcome by melancholia and gave up painting almost entirely after 1606. Annibale died in Rome and he was buried accordingly to his wish near Raphael in the Pantheon. The lute on the engraving is not depicted in much detail or with great care. 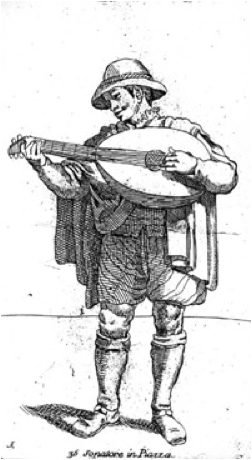 It seems to be a six to eight course lute, but only five pegs are visible. The lute has a long, but rather thin neck. The 'sonatore' is playing in the first position and his left arm and hand is held almost parallel with the strings.